Early Bird Ticket Pricing ENDS April 1, 2019! Join us for the latest information, and strategies to build RESILIENCE! CRI is honored to have expert presenters in their fields to showcase a diverse selection of sessions revolving around the BPT Conference theme, "Building Resilience Across the Life Span." Conference Session Descriptions and Presenter Biographies are now available for review! 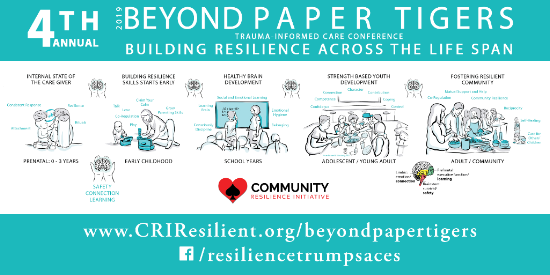 The 2019 Beyond Paper Tigers Trauma-Informed Care Conference on June 26 & 27, 2019 will revolve around the theme, "Building Resilience Across the Life Span," with Pre-Conference Trainings, Social/Networking event, and film screenings beginning on Tuesday June 25, 2019. The conference will be held at the Red Lion Hotel in Pasco, WA.